Convert multiple EPUB files (such as e-books) into the PDF format. User can set passwords for the converted files. Same or different passwords can be set according to the user choice. 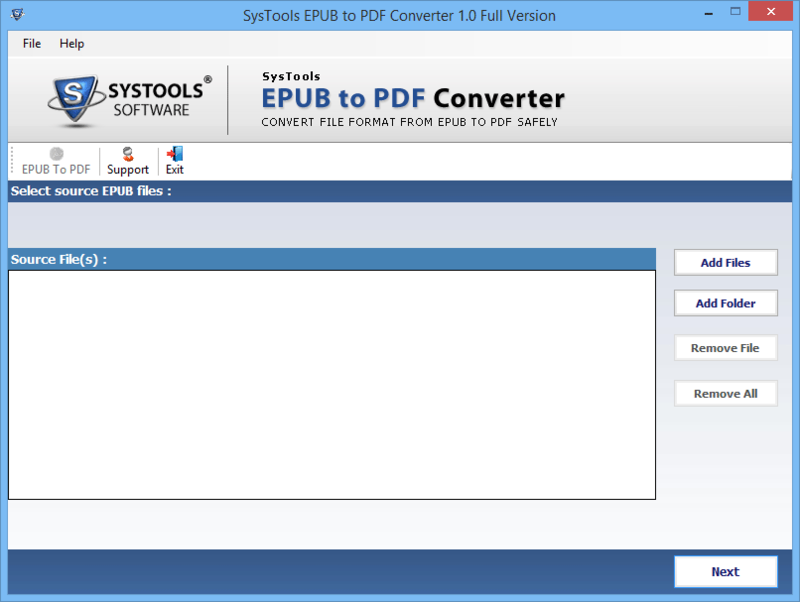 Can convert multiple EPUB files into a single PDF file. User friendly, easy to understand and implement. No file size limitation, and installation of adobe reader is necessary. 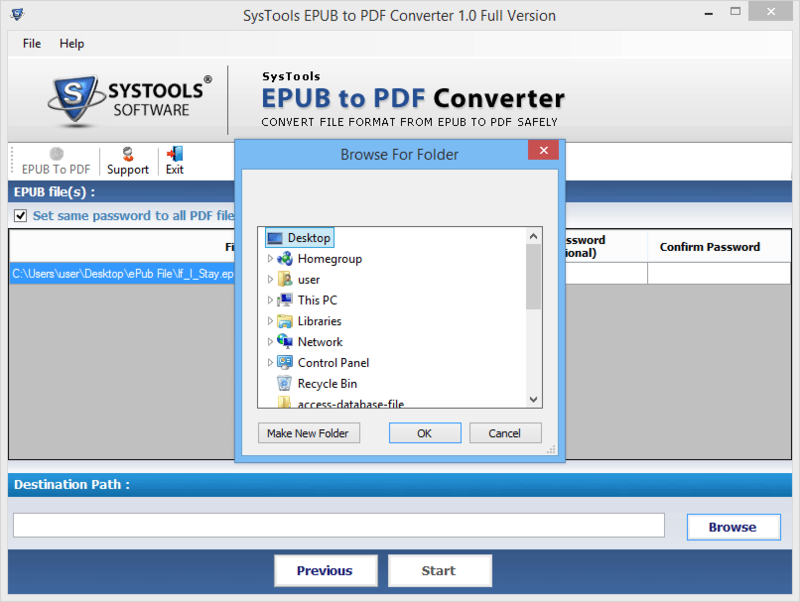 Tool supports the batch conversion, i.e., it can convert multiple EPUB files into a PDF file altogether. It was always been a difficult task to convert e-books in PDF format. It does not provide any restriction on the source of the EPUB file. 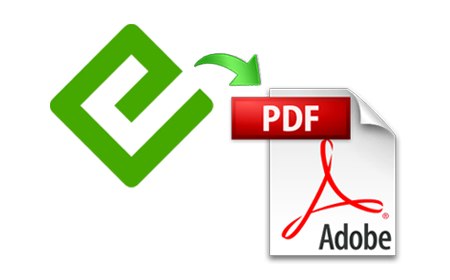 A file downloaded from any source can be converted into a PDF file. 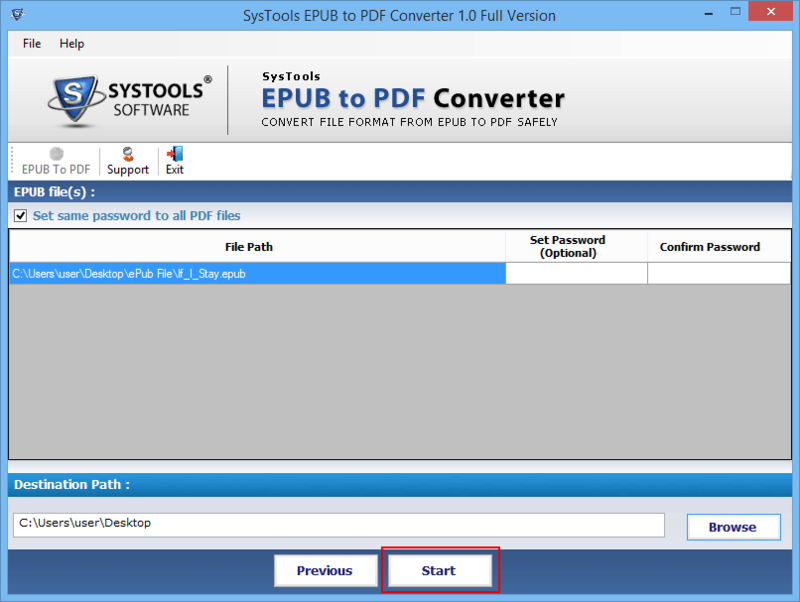 User can set a password for the EPUB file he is converting thus making it much more secure. 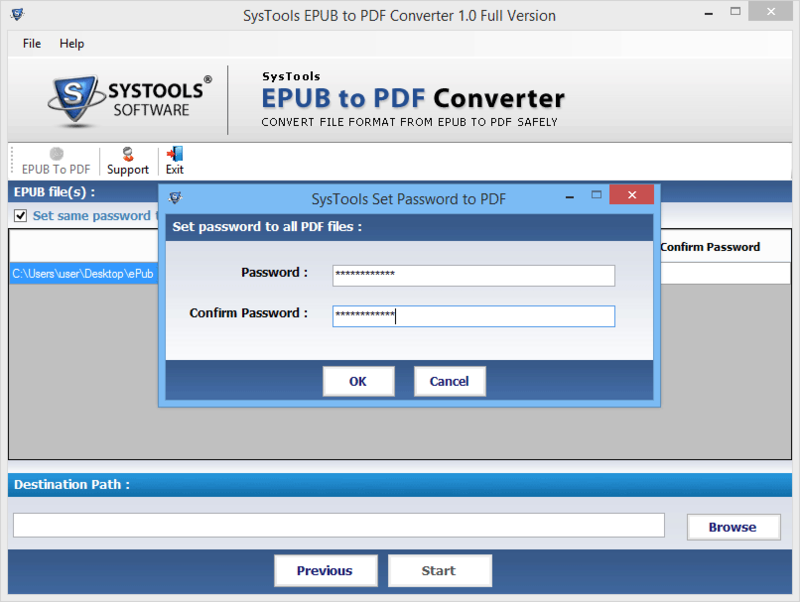 After the conversion, password will be required to open the resultant PDF file. It also provides an option to set different passwords for files and also user for his convenience can set a single password for multiple files. Tool is so easy to use that and requires no expert knowledge. Employees belonging to both technical and non technical fields can easily use the software. It reduces the headache of first understanding the working and then implementing the software, unlike other software. 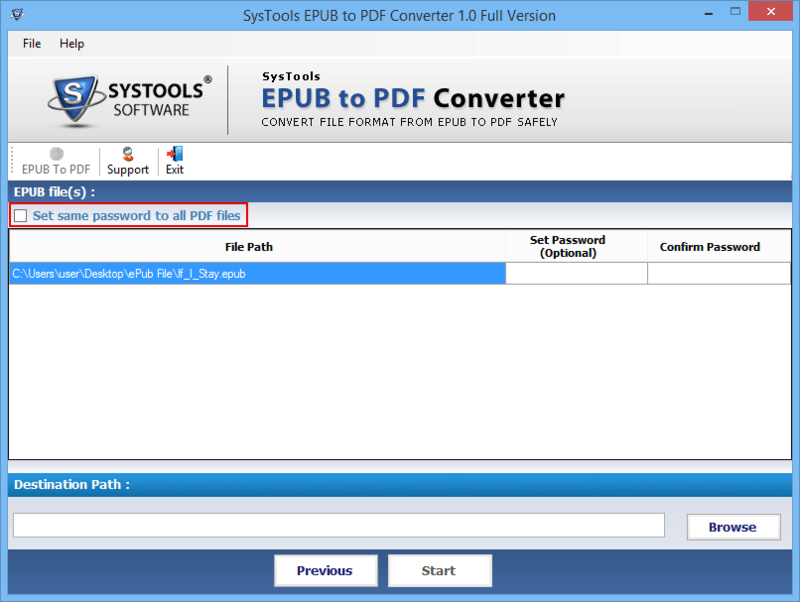 The PDF file generated on completion will be stored in a new folder. 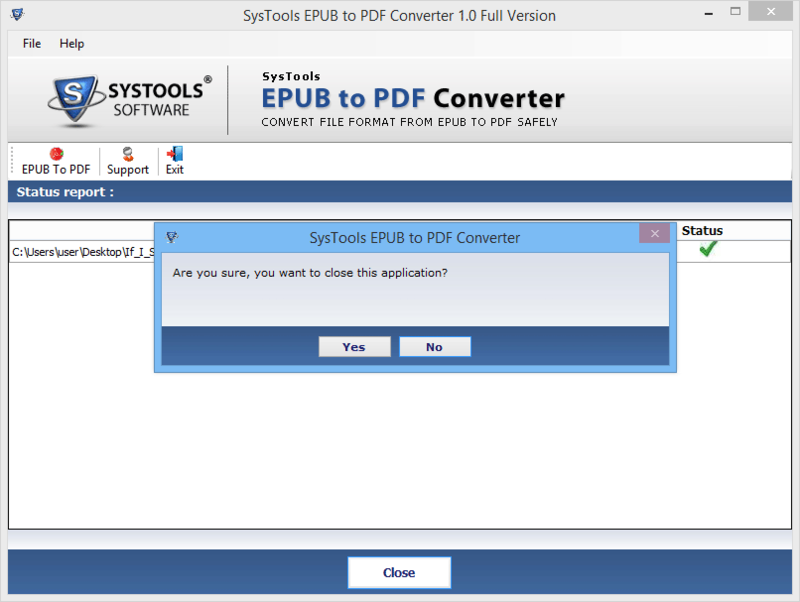 It also provides flexibility to store PDF file at any desired location user want to save. That location can be browsed from the software panel and file can be directly stored at desired location avoiding copy, paste. 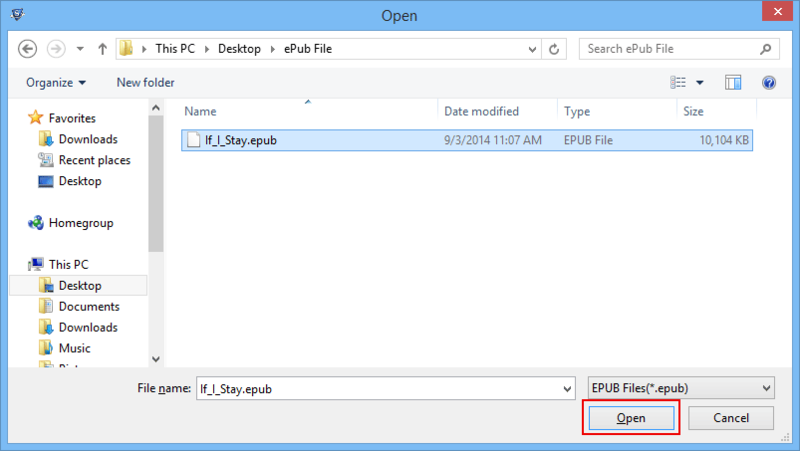 EPUB file of any size can be converted into PDF file. It does not provide any restriction on the size of the file. Along with no file size limitation, it also works on the file downloaded or copied from any source. Now your large e-books will be easily converted into PDF file in no time. The tool ensures that no data will be deleted during conversion. The structure of the file remains the same as that of the original file. And also, the quality of data embedded in the file is kept intact. No alterations will be made regarding the data present in the file. It can work with various versions of adobe acrobat reader, which includes the version 9.0 and below. And it is necessary to have acrobat reader installed on the system before implementing the tool. Step 1: Open the tool. Go to "Start" >> "EPUB to PDF Converter". Step 2: In order to add files / folder, select the "Add file" / "Add Folder" button respectively. 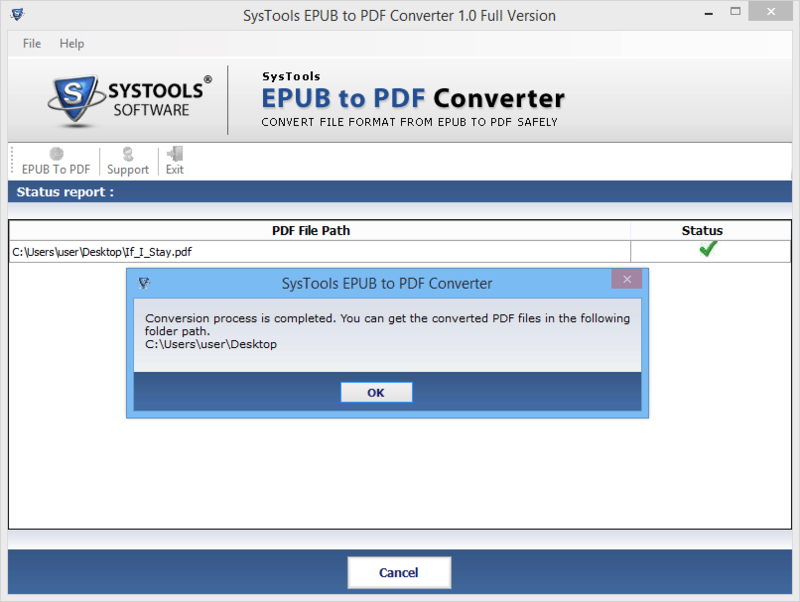 Step 3: Select the files and click "Open" to proceed with the conversion process. Step 4: You can also remove the selected file from the panel by selecting file & clicking "Remove" / "Remove All". Otherwise click "Next". Step 5: Password can be set on the converted file. So to set password mark the "set password to PDF" button. Step 6:Unique password for each file can also be set, enter the set password fields, and click "OK". 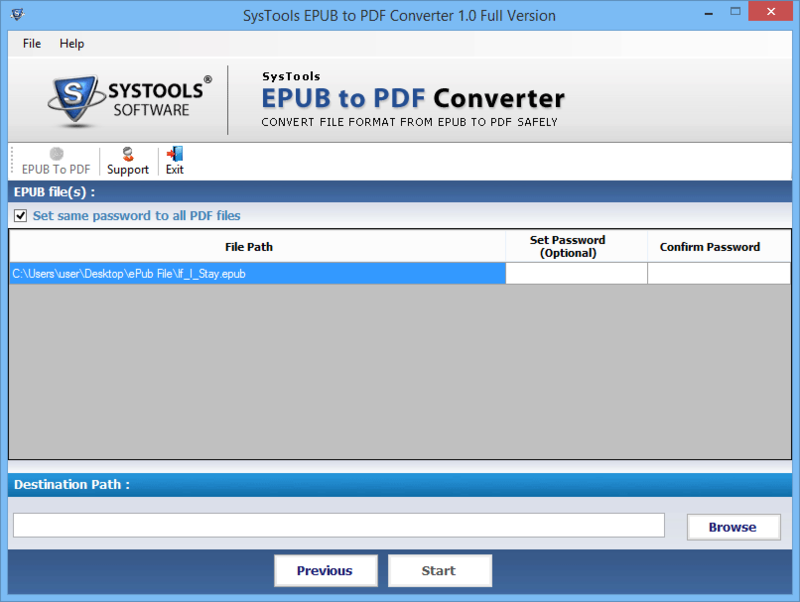 Step 7: Now the output PDF file will be password protected. Step 8: "Browse" the destination location to save the file. Step 9: Recheck the selected details and click "Start" to proceed with the conversion process. Step 10: Confirmation message will be received, click "OK" to close the tool. Step 11: Exit the application on successful completion of process. I was recommended about using no. of software and among those, I gained faith was this tool because of the free demo version it came with for testing its working. The demo version gave a kind of security and confirmation about the software's functionality. There had been many articles published from various publishing companies that encouraged me at writing and so I wanted to manage all my collection in a secured manner for which I worked daily. There I found your tool, and converted all articles to PDF and now I have easy access to all articles. Many thanks to your tool.